Limited strategic space in East Asia makes a long-term solution to China-Japan tensions imperative. A Chinese idiom says, “One mountain cannot contain two tigers.” Following this logic, a rising China inevitably would be regarded as a threat by the traditional dominant power or alliance in the region. This idiom does reflect Chinese thoughts and worries. The U.S. Asia policy also seems to affirm, in one way or another, China’s concern that the U.S. is returning to Asia to rebalance against or re-contain China. From a geopolitical view, China and the U.S. in fact have enough reasons and especially the necessary “distance” to keep the peace. What is missing, perhaps, is the vision and courage to do so. The disputes between China and the U.S. are not matters of survival in absolute terms. On the contrary, they are more symbolic than realistic. As the U.S. tries to re-build or re-strengthen the first and second island chain, it shows that the U.S. expects more respect from a rising China. The U.S. seeks a concrete acceptance of or even acquiescence to U.S. dominance in the region, although such dominance has been in a very delicate predicament. The U.S., however, is actually very lucky. Geopolitically and traditionally, the Pacific and the Atlantic Oceans jointly ensure the U.S. the strategic room to initiate an attack out of its territory and also realize effective defense as long as it intends. We may imagine: If Canada or Mexico had only half or even one-third of China’s population or GDP, would the U.S. still be able to always have the upper hand in North America? The situation between China and Japan is a lot different. The East Asian strategic setup is too complex, and regional strategic leeway is simply too limited. For example, the North Korea nuclear issue has kept five other parties entrapped in a seemingly endless marathon for more than a decade, with the unwelcome result being that North Korea has successfully developed a substantial nuclear capability. Sino-Japanese disputes are far more complicated than the genuinely brief history of communication and exchange between the People’s Republic of China and the U.S. Although there has been peaceful co-existence and even harmony between China and Japan before, the history between China and Japan, mixed with dispute, conflict, invasion, humiliation, revenge, and estrangement, is actually even longer than the history of the U.S. as an independent country. Hence, as an outsider (to a certain degree), the U.S. might not truly deeply understand or accept how heavy, critical, and significant a role historical memories play in Sino-Japanese relations. Japan, defeated in the World War II and the only country to be attacked by U.S. atomic bombs, thereafter has been a close ally to the U.S. Hence, the U.S. might wish that China and Japan could just accept and follow the pattern and structure designed by the U.S. in order to maintain regional stability. Yet questions remain: Is China truly willing to do this? Is Japan truly willing to do this? 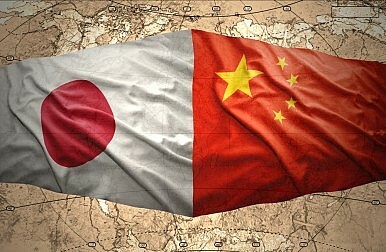 Are China and Japan truly willing to do this together? There’s an additional question as well: How long will the U.S. stay in East Asia? Will East Asian “perpetual peace” have to be built on the absolute hegemonic dominance of the U.S. in the region? Now that the international multi-lateral security promise made to Ukraine in 1994 has been ironically and decisively overturned by Russia, will the U.S. become trapped in both directions – the East and the West – and thus fail to meet both challenges? The current situation is critical and clear. China and Japan are the world’s second and third largest economies, and both are building up their military capacities significantly. In such a limited and intense strategic environment, can China and Japan eventually reach peaceful co-existence? Without doubt, a final settlement between China and Japan can hardly be realized through a temporary balance of power brought by the formation and maintenance of military alliances. If we follow the model of alliance-balancing, the only directly effective approach to break through the dilemma of “two tigers” is simply to add more weights on each side of the scale, until everyone get exhausted or even goes to war in the most extreme scenario. Another Chinese idiom says, “Whoever tied the knot on the bell is the one to untie it.” Outside intervention might be needed at some point, but the problems and disputes between China and Japan ultimately can only be solved through these two parties. It might be possible to keep a temporary peace through alliance building and maintenance, which is indeed necessary. Thus China won’t have to excessively fear and resist a strengthened U.S.-Japan alliance. However, the point is that a temporary peace by definition cannot go on for long. In his recent visit to Germany, Chinese President Xi Jinping claimed that in state-to-state relations, we can choose our friends but not our neighbors. Neighbors, Xi said, should get along with each other generation after generation. East Asia’s strategic situation is just like this. When the rise of China has become a fact and will continue in the foreseeable future, do we need to add more and more weights onto the alliance balance?